As I have probably talked about on here before, I am not the biggest fan of winter. I get so down with all of the long dark days and the lack of sun. But one of the things that gets me through this is my daughter. She is so happy and so thoughtful for being so young. We were sitting at lunch the other day when she said that she had to talk to Daddy about a surprise. Later I had found out that she wanted to surprise me by getting me flowers and told my husband that he had to take her to Walmart to buy me flowers for Valentine’s Day. While we were at my in-law’s house she found a bunch of fake roses and asked if she could surprise me with those. She was so excited to give them to me that she couldn’t wait until Valentine’s Day and she gave them to me right then and there. They are sitting in a vase in our living room and when I look at them it’s a reminder that even in the darkest of days there is always a little light around, you only have to look for it. 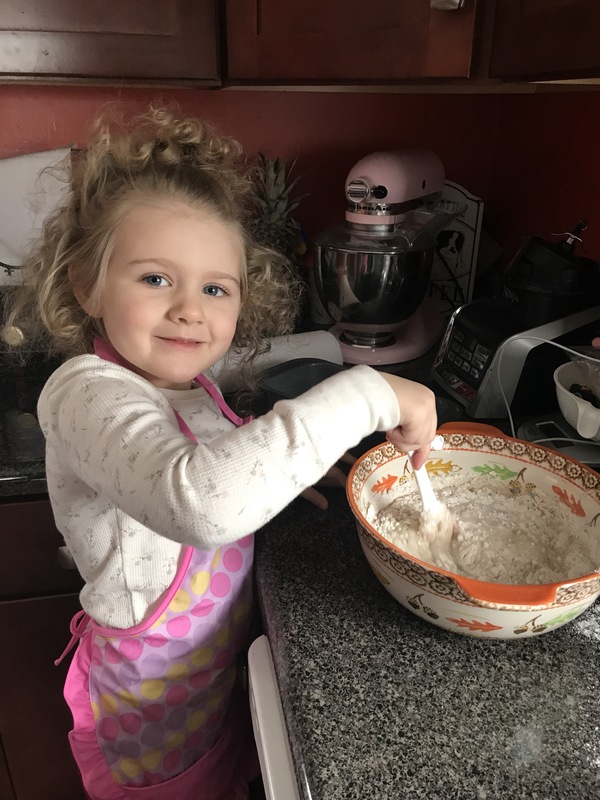 My little sunshine helping me make banana bread a few days ago. Life has been crazy. There is no more of a reason as to why this blog hasn’t been updated forever. Having a young daughter, finding a house, buying said house and then putting our current house on the market and trying to sell it has been taking all my energy and time. But I have missed Mousekatots so much so I am going to try and get back into the swing of things and take you on our new house adventure and also the process of trying to sell our house. Plus, there is a lot of Disney news happening so you might want to come back and check this out. So look tomorrow for more of a blog. I hate natural disaster movies. I am terrified of them. A movie about a serial killer? I can handle that. A demonic possession film? No problem! But, when it comes to films about natural disasters taking out whole towns, I can’t watch it. It becomes too real. For many people these events have become very real over the past few weeks as first Hurricane Harvey and then Hurricane Irma hit in the southern United States and the Caribbean, respectively. Beautiful islands were utterly destroyed. Homes, resorts, hospitals, businesses all left in rubble after Irma’s wake. It was just a few years ago that we were at St. Martin and St. Thomas enjoying these tropical paradises, and now they are torn apart. With Irma sweeping through Florida now and aid finally arriving in the Caribbean islands, we are getting a good picture of what little is left. Almost total damage to the island of St. Martin that’s only source of income is tourism. On the island of Tortolla, there were reports of looting and people turning on one another in order to obtain precious resources. With all of this going on, many of us are sitting back wondering what can we do to help? Unfortunately, in today’s landscape it is easy to find people who set up scams praying on people want to assist. MSN has this great article on how to help but also how to avoid scams. One of their biggest suggestions is to go to the website Charity Navigator (charitynavigator.com) to do a search to see how the charity is rated and how they spend the money they raised. For those that want to travel to the areas affected to lend a hand should check with their local Red Cross or Salvation Army to see how to do this. Only time will tell how long it will take for these places to recoup what has been lost and to get back on their feet. But, even giving just a little will help. Especially on this day in United States’ history when our country was changed forever with the terrorist attacks on The World Trade Center, Pentagon and Somerset, Pennsylvania, it is a good way to do something to make a horrible historic day a little more positive. Halloween is a big deal in our house. Actually, it is Lily’s favorite holiday. Luckily our local Lowes already has a lot of Halloween stuff in store so we were able to take Lily to see the decorations. It is hard to believe that summer is almost over. It seems like it was just Fourth of July and now kids are going back to school and Halloween candy is making its appearance on store shelves. We try our best to do everything on our “Summer Bucket List” but inevitability we realize that we can’t get everything done. This year was especially difficult because our weather was more rainy and cooler on Saturdays, the days that we usually go and do our adventures. After trying for about a month, we finally made it to the Soak Zone at Idlewild park last weekend. Included with a ticket to Idlewild park is Soak Zone, a small water park. While we had been to the rest of the park through this year, we hadn’t been to the water park portion. When I say it is a smallish water park, it is by no means tiny. There are about five different areas in the water park. Soak Zone includes an awesome wave pool (which is where we spent most of our time), I think four water slides (it could be more), a lazy river type attraction, a little kids play area and a bigger kids play area that features a dump bucket with a bunch of kid sized water slides, plus a stand alone dump bucket. When we first arrived last Saturday it seemed like it was going to be a little cool and very cloudy. However, luck was on our side and it became pretty sunny and warm and we made it out before a storm hit. Personally, my favorite place to spend time was at the Wowabunga Wavepool. Lily could swim around and splash between wave sessions, and when the waves began, we sat on the “beach” and let the waves rush up on us. Lily seemed to really enjoy the little kids splash area. The pool is only about one foot deep and features tubes that spray water up and down. Kids even have the option of turning a valve that controls how much water sprays out. We had such a wonderful day full of lots of family fun and memories. We sure tired out Lily by spending almost four hours splashing around. We finished the day off by taking a ride on the carousel and grabbing a quick lunch before leaving. Lily was asleep before we hit the main road to home. Did you get to do a lot on your “Summer Bucket List?” Leave a comment below. Unexpected changes that seem to blot out the light can be scary or they can be a thrilling adventure. For example, today the cosmos will host a unique event, a total solar eclipse (cue the Bonnie Tyler music). While we will only see an 80 percent eclipse where we live, we will still be able to experience the event. Leading up to the eclipse, I have been reading about a lot of people traveling to different destinations to find the optimum viewing location, it made me do some thinking. A few weeks ago, about a month actually, I had shared that I had lost my job as a newspaper reporter after the paper I was working for was purchased by another company. When this happened, I went through all the emotions of grief (anger, sadness, loss of hope, etc.). Here I was suddenly flung into an unknown situation against my will. So for a few weeks I felt like I was in the eclipse part of this situation. However, for the past few weeks I feel like I have transitioned to the other side of the eclipse. I have realized how blessed I am to have the opportunity to follow my dreams of being a children’s book author and eventually middle grade novelist as well as continue my love of being a blogger. I think that sometimes it becomes difficult to trust when things happen that it is actually a gift. We can’t see because the sun is being blocked out. But, once things seem to get back to normal or, for most of us, the new normal, the hope returns and we can then again see the silver lining of life’s situation. Have you experienced any difficult life situations that have made you better for it? Leave your comments below.